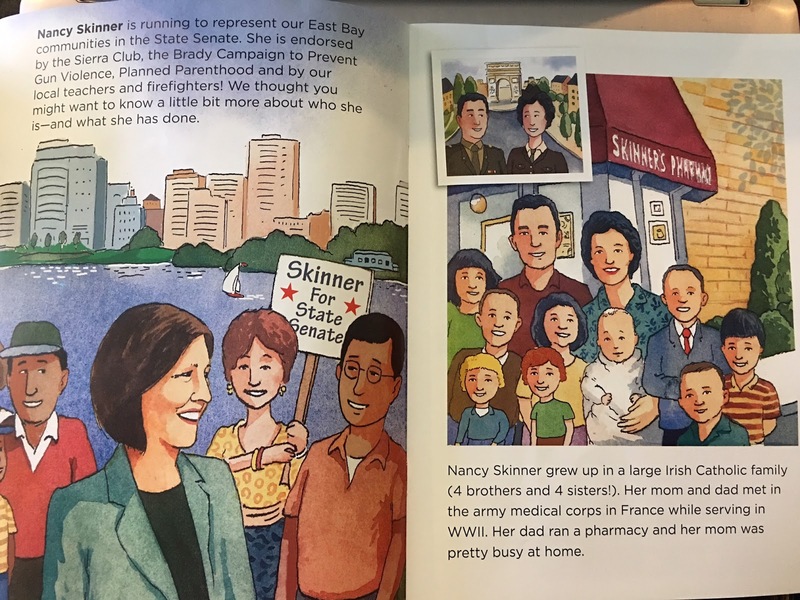 Some voters in the East Bay’s Ninth State Senate District received a direct-mail piece from candidate Nancy Skinner this week designed as an eight-page children’s book that ells the story of her life and career in politics. It’s one of the strangest political mailers you’re ever going to see. Titled, “Nancy Skinner. A lifetime fighting for change,” the mailer is a collection of water color-style drawings depicting the former East Bay assemblymember’s life. Skinner’s campaign coffers have long been a story in this race and her campaign appears willing to spend heavily on direct-mail down the stretch to the Nov. 8 election. The campaign reported $616,299 in cash on hand through Oct. 22—the final reporting period before Election Day. 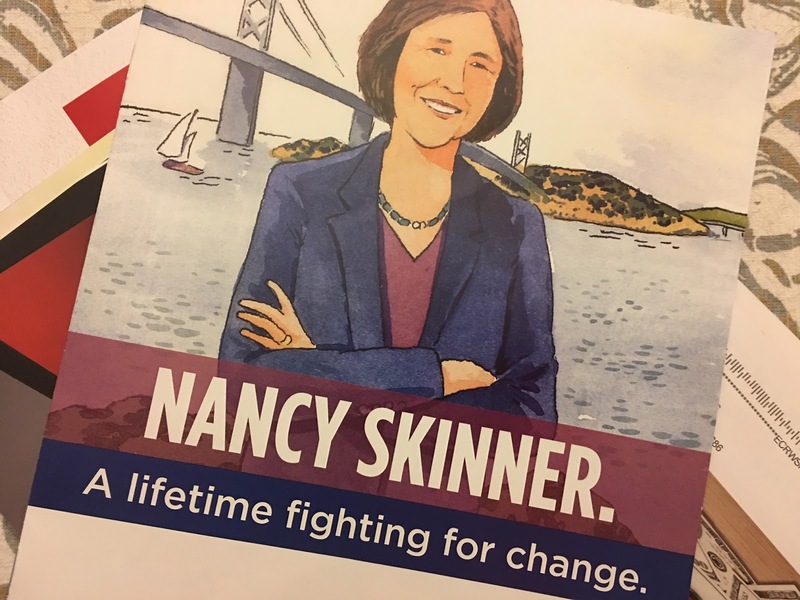 The campaign’s deep pockets have allowed Skinner to not only blanket the state Senate District that reaches into Richmond, Berkeley, Oakland, Alameda and San Leandro, with mailers, but also to target specific issues and areas. For instance, one mailer aims to vie for Alameda, an area once considered a stronghold for her opponent, Sandre Swanson, who lives on the island. Another illustrates the need to vote more women into the state Legislature, along with Skinner’s Sierra Club endorsement. Yet, another large 8 by 11 inch piece features a jarring photo of an assault weapon, with the tagline, “Who can we trust to lead the fight to prevent gun violence?” Skinner has authored legislation in the past to enact stronger gun control measures in the state. The amount of spending by Skinner has greatly dwarfed Swanson’s effort. From late September to the end of October, Skinner’s spent roughly $500,000 during the period–five times more than Swanson—who also reported just $8,404 in cash for the final weeks of the campaign. Posted in 2016 Election, campaign finance, children's book, gun violence, mailer, Nancy Skinner, Planned Parenthood, SD9, State Senate. Bookmark the permalink. The last really big spender in an East Bay politician's campaign for election was Nadia Lockyer. To the best of my recollection she spent over two million dollars in her campaign to get on the AC Board of Supervisors, and even though the typical past expenditure in a campaign to win such a seat had been 100K or less, and some people had managed to win a seat even after spending only about 30K; and the very biggest past spenders had spent only about 250K or so. So Nadia Lockyer had not only broken all past records in wild spending, but had totally smashed them to smithereens. However by spending such huge sums she was able to “prove” that she was very highly and overwhelmingly “qualified,” and in fact far and away the “best” candidate. We saw how that turned out. And then back in the 1990's there was the organized crime kingpin (however he did go thru a light charade of pretending to be a legitimate businessman) who decided be wanted to become the US Ambassador to Switzerland. So when some members of the US Senate began objecting to that world class sleazeball becoming the Ambassador, he then hired the most prominent and powerful member of one of Washington DC's biggest law and lobbying firms to cajole the members of the Senate into approving him. But then, and after he died, he was buried in Arlington National Cemetery, since he had been a “great war hero” during World War 2. However about a year after he was buried in Arlington it was discovered that he had never even served in WW2, let alone been a big war hero, and which caused him to be the very first person in US history to be forced out of Arlington. So we should always be very skeptical of those who spend huge sums of money to “inform” and “educate” us as to how extremely “wonderful” they are. Related to my above post, we presently have in the East Bay a character by the name of Nancy O'Malley, in other words AC's DA, who puts a huge amount of effort into constantly “educating” and “informing” us how extremely “wonderful” she is. However she should put a lot less effort into PR and more effort into learning how to do a proper investigation.